Report shows Kerry's staff plans to 'attack' Netanyahu in January, make him submit to US arrangement uprooting Jordan Valley communities. US Secretary of State John Kerry appears to be pressing a national plan, devised in Washington DC, upon Prime Minister Binyamin Netanyahu. The proposal comes as part of peace talks with the Palestinian Authority (PA), and includes uprooting Jewish communities from the Jordan Valley. 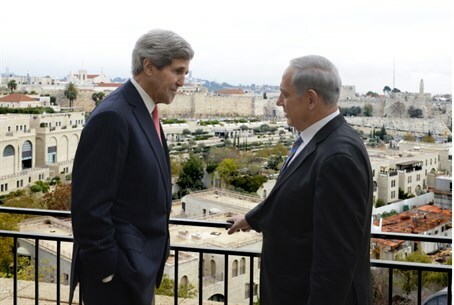 Kerry's staff rented 50 rooms at a luxurious Jerusalem hotel for January, in order to "attack" Netanyahu and demand that he accept the US plan, reported Yedioth Aharonoth on Friday. The plan, which Arutz Sheva analyst Mark Langfan has called a "death-trap" for Israel, would let the country for 10 years partially retain the 15 kilometer (9 mile) wide strip of the Jordan Valley as a security zone. In fact, the plan doesn't even meet the minimum "defensible" Israeli borders as determined by the US Joint Chiefs of Staff (USJCoS) in 1967, even according to military realities of that time. The Israeli daily's report noted that over a month ago, Kerry's security staff head, General John Allen, spoke before the IDF and Defense Ministry about security arrangements. After the Israelis added notes to Allen's work, it was presented to Netanyahu two weeks ago. According to the report, Netanyahu did not rule out the plan, and said he was ready to accept parts of it, but only if Israel's serious concerns about security are accommodated into the plan. In this way, it is thought that Netanyahu tried to shift US pressure onto Defense Minister Moshe Ya'alon, perhaps expecting Ya'alon to be able to shelve the plan. Deputy Minister MK Ofir Akunis (Likud) strongly rejected the idea of uprooting communities in the Jordan Valley. "We need to say: it will never happen! In the Valley, at a distance of 70 kilometers (43.5 miles) from the Mediterranean Sea, the pioneers settled in our generation. In difficult conditions, distanced from large urban centers, they are developing complete wilderness. There is no demographic problem, because the 'Palestinians' didn't settle there," said Akunis. "When the Jewish nation returned to its homeland, after the exile in Egypt (over 3,000 years ago as recorded in the Bible), it entered through the Jordan Valley. We must not agree to concessions, withdrawals or expulsions: not in the Valley and not in any other place in our country," emphasized the MK. The news of Israeli US tension come as Israel has seen a strong rapprochement with China, highlighted by Chinese Foreign Minister Wang Yi's first Israel visit this week. Reports also detail that a security pact has been sealed between Israel and Russia.